as small, fried, airy personal pancakes usually eaten with jam and cream (Peter). This should make about 40 x 3" diameter pikelets - enough for 2-4 people. FYI, AKA: pancakes. 1. Thoroughly combine flour, bicarbonate of soda and baking powder. 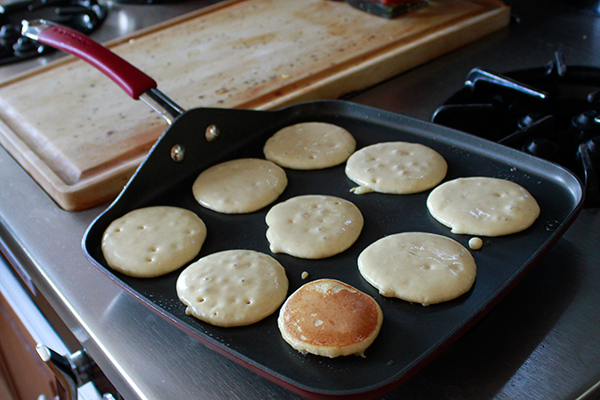 (Baking powder is a "leavening agent" which will add air and cause the pikelets to rise when cooking). 2. Add lemon juice or vinegar to milk (or use buttermilk). 3. Form a well in the flour and add eggs, sugar, milk and oil/butter. Mix strenuously with a wooden spoon until all lumps are gone. 4. Heat a non-stick flat pan lightly coated with oil or butter. 5. Check for consistency - should be liquid enough to slow pour but still thick. Add more milk or flour if needed. 6. Pour around a tablespoon onto your cooking surface set to medium/high. 6. When bubbles appear on the gooey top it's time to carefully turn using a flat plastic spatula. 7. Serve hot and continue cooking.